Macular degeneration is the most common cause of irreversible blindness in people over the age of 65, but there are several hereditary conditions, which can lead to this disorder at a much earlier age. It is a slow progressive disease that affects the center of the vision. This location is called macula and is responsible for central vision and gives us greatest detail in our sight. The exact cause of macular degeneration and age-related macular degeneration is not known. However the are risk factors such as age, family history, smoking, ethnicity, alcohol, sunlight, obesity, high blood pressure and heart disease which increase the risk of developing it. The earliest changes in macular degeneration occur in the choroid, the vascular layer of the eye, underneath the retina and pigmented retinal epithelium. These changes begin as thickening of Bruch’s membrane, which is the most inner layer of choroid underneath pigmented retinal epithelium. These thickened areas become raised and have the appearance of warts. These changes produce loss of pigment and cell death of the functioning layers of the retina. It eventually leads to fluid accumulation, hemorrhage and scar tissue. This result in loss of central vision, but this rarely produces total blindness, because the peripheral vision is preserved. Patients usually complain of blurred vision and difficulty with close work. They can also develop wavy lines and distortion on the center of the vision and scotomas or black spots. There is a higher incidence of macular degeneration with hypertension, arteriosclerotic vascular disease and diabetes. 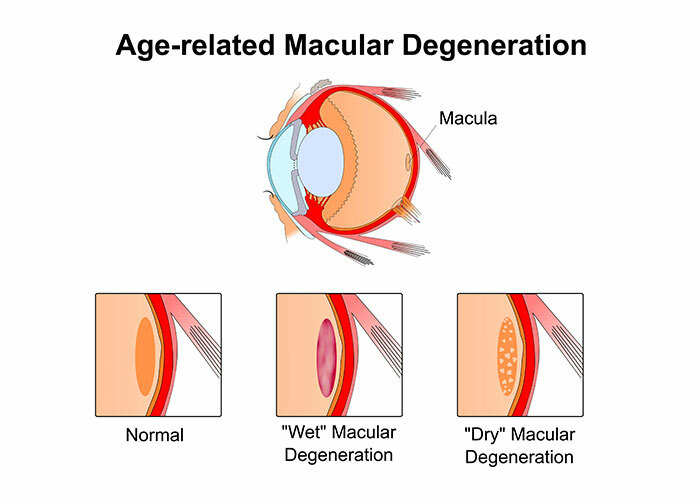 There are two common types of macular degeneration described dry and wet. Approximately 85% – 90% of the cases of macular degeneration are the dry type. In the dry type of macular degeneration, drusen or small yellow deposits are accumulated underneath the basement membrane of the retinal pigment epithelium in the macula, which is the cause of deterioration of the vision. As a result of this accumulation macula thins out and subsequently loses its function. Almost all people over the age of 50 years have at least one small drusen in one or both eyes, however it is only eyes with large drusen that are at risk for late age-related macular degeneration. The AREDS2 data suggested that the beta-carotene in the original AREDS supplements could be replaced by lutein and zeaxanthin, which provides a safer drug for those who, are smokers or former smokers. Also too even though consuming fish reduced the risk of macular deregulation in the observational studies, the AREDS2 results showed that omega-3 long-chain polyunsaturated fatty acids (docosahexaenoic acid/eicosapentaenoic acid) had no beneficial effect on age related macular degeneration. Approximately 10-15% of the cases of macular degeneration are the wet type. In wet type abnormal blood vessels underneath the retina in the macula area forms. These new blood vessels subsequently bleed and leak fluid, causing the macula to bulge and lift up from its normally flat position. Through this anatomical change patient experience distorting or even destroying of the central vision. Dry Macular degeneration treatment is generally with nutritional therapy and a diet high in antioxidant and supportive of the macula. Certain vitamins and minerals are prescribed as described above to support the cell structure. Laser Photo-Coagulation and Photodynamic Therapy (PDT), the laser treatment reduces the number of vessels and slows their leakage. Anti-VEGF (Vascular Endothelial Growth Factor) Therapy works to inhibit blood vessel growth. Anti-VEGF treatment helps reduce the number of abnormal blood vessels in the retina. It also slows leakage from blood vessels. Anti-VEGF medicine is injected to the eye through a very small needle. Despite the major progress in the discovery of gene variants associated with macular degeneration, the use of genetic testing to predict disease has not yet been clinically useful. There is growing evidence of the importance of nutrition in age-related macular degeneration and there has been a long-standing interest between the role of diet and macular deregulation prevention and treatment. There is a report on the association between homocysteine, folate (vitamin B-9), and vitamin B-12 and the incidence of macular deregulation over 10 years in people taking part in the “Blue Mountains Eye Study in Australia”. This study found that increased concentrations of serum total homocysteine were associated with about 30% increased development of macular deregulation over 10 years. On the other hand increased concentrations of serum vitamin B-12 were associated with 30% reduction in macular degeneration development and increased serum folate was associated with 10% reduction in macular degeneration development. Additionally, people with folate or vitamin B-12 deficiency at baseline were approximately twice as likely to get macular deregulation. In another study “Women’s Antioxidant and Folic Acid Cardiovascular Study”, found that supplementation with vitamins B-6, B-9, and B-12 resulted in a 40% reduction in the risk of developing macular deregulation over an average of 7 years of follow-up. In another interesting study the consumption of a high-glycemic diet resulted in many macular degeneration features like RPE hypopigmentation and atrophy, lipofuscin accumulation, and photoreceptor degeneration, whereas consumption of the lower-glycemic diet did not. Critically, switching from the high glycemic to the low glycemic diet even late in life arrested or reversed macular deregulation features. Gut microbiome is responsive to diet. A study showed in addition to high glycemic diet, Clostridial bacteria in the gut was associated with macular degeneration. On the other hand Serotonin, Bacteroids and low glycemic index diet were protective against macular degeneration. The gut-retina axis is a true fascination as modification in the intestinal microbiome with diet can be protective of this sight threatening disease. An in depth eye history: This is required to explore and understand the underlying cause of the disease, which has contributed to the eye problem and use this information to develop a treatment plan to regain vision. Zinc Taste Test: A simple 2 minute test that measures the intracellular level of zinc. Zinc is a key nutrient not only for the eye but also every enzymatic function in the body. A deficiency of zinc is a red flag that there are probably nutritional deficiencies in other vitamins and minerals. Six-hour urine collection for heavy metal toxicity: This test is the gold standard to determine the levels of toxic minerals in your body. Urine is collected for 6 hours and then sent to a specialized laboratory for analysis.